This is a story narrated by a little boy who has a best friend called Carlos and a brother called Will. He loves going over to Carlos’ house because he can play with toy soldiers and leave them lying around wherever he likes. At home he cannot do that because his brother might trip on them. Therein unfolds the touching story of this boy’s life who lives with a brother who does not need a torch to read at night; who has a Labrador dog all for himself; who counts all the steps in staircases; who’s got a perfect memory and is a great storyteller. It is the reader, in fact, who must detect the fact that Will is blind. Never once does the boy refer to it; in fact, if anything, he does not seem to see it, and actually considers his brother’s visual impairment and his use of hearing, touch and smell as an advantage. “My brother is lucky,” he says at one point. 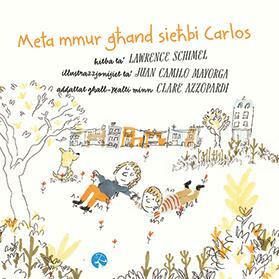 Meta Mmur Għand Sieħbi Carlos is another groundbreaking picture book published by Merlin Publishers. “We believe in breaking down barriers and challenging stereotypes. Every child should be able to find him or herself in books, and mainstream books need to represent every child,” said Merlin Publishers’ director Chris Gruppetta. The book is written by Lawrence Schimel – an award-winning American writer whose work frequently deals with taboo subjects. “We are honoured to be translating his work – Mr Schimel’s writing is lauded for tackling topics that are often difficult to deal with. In fact, he’s been translated into over 30 languages,” said Dr Gruppetta. The elegant prose is illustrated by Juan Camilo Mayorga in realistic childlike paintings with which children will easily identify. It has been adapted to Maltese by children’s author Clare Azzopardi, who has long wanted to work on a book written by Schimel. “His children’s books tackle unusual themes and therefore they are more of a challenge to translate,” Azzopardi said. “This was one of them… it deals with visual impairment, a topic you need to research thoroughly in order to be able to write about it. Translating it was exciting, not only because of the language challenges but also because thematically this is a sensitive, delicate and emotional book,” she said. The aim of the book is to represent visual impairment in a positive way, both for families who live with it but also for other younger readers to begin to view inclusion in a favourable light. According to Merlin Publishers, books are always a great way to start a conversation with children about people with disabilities. Meta Mmur Għand Sieħbi Carlos also shows children the importance of looking on the bright side and being thankful for all the blessings in their lives. It helps them to put their concerns about little problems in perspective. “We want to introduce this kind of open-mindedness to our youngest learners when they’re starting to shape their notions about how the world is and how we should be treating other people. That’s how future generations can improve on us,” said Dr Gruppetta. Meta Mmur Għand Sieħbi Carlos is on sale at all leading bookshops or directly from merlinpublishers.com.